Welcome to all the new members who joined the club this fall! And thanks to all our members for your support and participation this year! Pop some popcorn! Here are two new ATV videos with great scenery. The Western Slope ATV Association, a hard-working ATV club in Colorado, made a high-quality video about who they are and what they do. It has lots of scenic riding footage in the Rockies, and interviews with club members and folks they work with on trails. They paid for the video using a state trails grant, and hired an independent film maker who wrote, shot and produced it. RZR 800 For Sale -- Club VP John Dickerman has his RZR 800 up for sale. It has 3600 miles, and $2800 in extras, including doors, roof, cargo box, and spare rim/tire. Asking price is $7500. John is original buyer and has all service records. Contact him at 507-317-7711. Action Alert! In 2012 the Consumer Product Safety Commission (CPSC) considered having manufacturers add roll bars to all ATVs. The industry stopped this effort, showing how it would increase serious injuries, not prevent them. Now, the CPSC is proposing mandatory design standards for Side-by-Sides that the manufacturers and industry organizations say would negatively affect handling and performance. To learn more and oppose this proposal during the public comment period using an automatic letter, here is a link to the Polaris campaign to stop the CPSC from over-reaching: http://polarisvotes.com/cpsc-rov-rulemaking-take-action-in-opposition/. Enter To Win A Polaris Youth RZR 170 EFI. Here is a link to enter your name for this weekly drawing. Ribbon Cutting For New ATV Trail. Ron Potter, recently retired from the MN DNR, a NOHVCC consultant, and a member of the Woodtick Wheelers, helped create a new trail in the Superior National Forest. The 27-mile Jackpot Loop was created by building a new trail that hooks up with the Stony Spur Trail. The ribbon cutting ceremony was earlier this month. Way to go Ron! Club Publicity. Again this year, the Pilot-Independent has asked us for an article updating what the club is up to. The article and photos will be published in several tourism publications. Watch for them next spring. A number of members have joined the club after seeing these articles in the past. 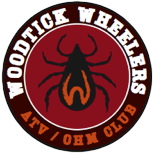 Interested In Being A Youth ATV Safety Instructor or Trail Ambassador? Free ORV & Snow Trails Mobile Apps -- Heading south to ride your ATV this winter? Be sure to download the free Polaris RiderX ORV Trails mobile app on your smart phone. It shows your GPS location on any ATV trail in the country, plus weather radar, and locations for food, fuel and lodging. Riding the snow trails this winter? Download the RiderX Snow Trails app. Find both apps on the app store for your phone. You can also view RiderX on your computer, at RiderX.com. The Coalition of Recreational Trail Users (CRTU, made up of 3 directors from ATVAM, MNUSA, ARMCA and MN4WDA) is working on a project to create user-friendly maps (see right map in photo) to show all OHV trails in the Chippewa and Superior National Forests, supplementing the user-unfriendly federal maps (left map). Many meetings have been held so far with the Forests, DNR and Counties, and thanks to Polaris, this mapping project will now move forward. Dave Halsey is a director with CRTU and on the work group for this project. Thanks Polaris! Nice post. I learn something totally new and challenging on websites I stumbleupon every day. It's always exciting to read through content from other authors and practice something from other sites. Hi, I do think your site could possibly be having internet browser compatibility issues. Whenever I look at your blog in Safari, it looks fine however, if opening in IE, it has some overlapping issues. I simply wanted to provide you with a quick heads up! Apart from that, excellent website!